This is a fun game to play before Halloween. Have children help you fill up a gift bag or small paper lunch bag with Halloween treats. Add anything related to Halloween into the bags including: Halloween candy, little plastic spiders, and/or rubber Halloween characters. 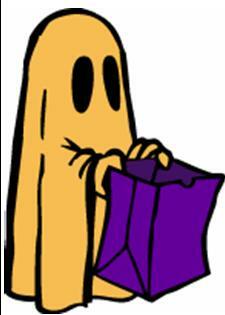 Each bag must include a paper ghost, so have your charges cut out the paper ghost to put in each bag. along with this poem for the tradition to live. Have you ever tried this cute game with the children’s friends or neighbors? Do you have other games to play with children before Halloween? « Modernizing Mari Poppinz Nanny Essay Contest! My charge is to young to do this currently. But I am sharing the idea with other young kids I know and will save it for him the future.It's his first Halloween this year. He's going as a lobster and bosses are going as chefs. They got all the costumes. We are trying out how to convert one of his riding toys into the pot to cook (transport) him in.